1. Crisis. Capitalism is inherently unstable. The capitalist system is crisis ridden. Cycles of boom and bust are part of the system. Capitalism is constantly generating its own grave diggers, as Marx pointed out. Stability in one area is a result of crisis in another just as comfort in the First World is a result of suffering in the Third World. The system is constantly creating the conditions for its own destruction. By shifting the burden onto poor peoples, onto the Third World, capitalism creates those who will do away with the system. Also, as the process of globalization continues, a crisis in one area spreads more rapidly to other areas. A local crisis can become global very quickly. The process of globalization has strengthened capitalism, but also brought about a situation where its crises is not as easily localized or managed. This can be exploited by Leading Lights. 2. 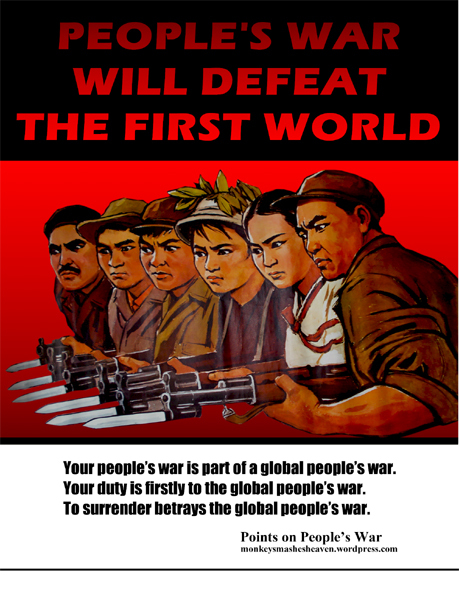 Global People’s War. Oppression creates resistance. The imperialist system has consigned the vast majority of humanity to grueling poverty. The median income worldwide is under 3 dollars a day. This means half of humanity is barely surviving from day to day. As resources are exhausted, the First World tightens the screws on the Third World to maintain its privilege. Famines, lack of water, genocide, ecological catastrophe, crises all increase. People of the Third World fight back in various ways. Like anything else, learning to fight is a process. People learn from successes and failures. This is the nature of science. Eventually, the exploited majority will pick up revolutionary science, the most powerful weapon available in the task of liberation. The next wave of revolution is coming. The world will be set ablaze with people’s wars that will merge into a single global people’s war of the Leading Light. The global people’s war will begin in the global countryside and global slum of the Third World. It will cut off and encircle the global city of the First World. Finally, the First World will be conquered by revolutionary forces from within and without. The exact contours of the global people’s war cannot be known in advance. In many places it will take the shape of classic Maoist people’s wars, moving from rural areas in poor countries to the cities. However, new technologies and changing demographics open up more and more possibilities. It will involve re-proletarization of the First World. It may involve a people’s war that spills over into the United States. For example, a people’s war in Mexico could spill over into the southern areas of the United States. There may be literal invasions of the First World by peoples of the Third World. Parts of the First World could find themselves conquered in the same way that the Soviet Union destroyed fascism and imposed a new system on Nazi Germany. 3. Re-proletarization. Currently, social tension within US borders is lessened, contradictions made non-antagonistic, due to imperialism. The United States receives so much value from the imperialist system by exploiting the peoples of the Third World that economic, gender, and even national struggles within its borders have been transformed in important ways in the United States. The First World way of life is propped up by the massive exploitation of the peoples of the Third World. Economic conflict within the United States, generally speaking, has become less and less antagonistic because the burden has been so shifted onto Third World peoples. Gender conflicts, generally speaking, also become less and less acute because of the relative autonomy that is available to First World individuals. Even conflicts between oppressed nations in the United States and their oppressor nations become less antagonistic. As more and more oppressed nation peoples receive the benefits of their status as First World peoples, there is less and less desire to assert themselves as distinct nations, generally speaking. The relative peace of First World, and US society, is created by shifting the exploitation onto Third World peoples. However, this system is unstable. Capitalism is unstable, crisis ridden. People fight back. As more and more people become organized in the Third World, as Leading Light and anti-imperialist struggles beat back the imperialists, more and more Third World peoples will conquer state power and de-link their economies from the capitalist-imperialist system. Thus the First World, including the United States, will be denied access to their labor and resources. The imperialists will have to fight more and more wars to defend their privilege. They will have to tighten the screws on other Third World peoples, which will cause more resistance. They will need to dedicate more and more value and resources toward fighting the Third World peoples. They will, ultimately, have to turn inward, to cannibalize their own First World people, to maintain their power. In other words, as Third World peoples become free, the imperialists will need to begin exploiting their own populations again to make up the difference. This will mean that First World peoples will become poorer and poorer as Third World peoples become free and prosperous. As this process happens, some First World populations will break right and embrace fascism and social fascism in order to try to protect their privilege as First World peoples. Others will break left and begin to stand with the vast majority of humanity in the Third World. At first, the majority will break right, but eventually, the process of re-proletarization will spread. Eventually, a proletarian class will arise in what was the First World. 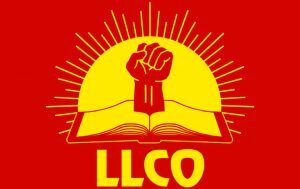 This class can then be organized by the Leading Light to overthrow its capitalist overlords. This class will be part of the international proletariat. 4. Balkanization. The United States has a long history of brutal oppression of oppressed nations within its borders. The United States was founded on White supremacy and racism. The United States waged the greatest genocide in history when it exterminated most of its indigenous population. The land was cleared of indigenous peoples to make way for westward expansion. Indigenous peoples were herded into prison camps that later became reservations. Social tensions of early capitalism were lessened because European-descended peoples, and later Blacks, Asians, and others could graduate from workers to land owners, from proletariat to bourgeoisie and petty bourgeoisie. The frontier was a safety valve for social tensions not only in North America, but also Europe. The marginalized of Europe and elsewhere made their way to North America to settle on Indigenous land. In addition, slavery played a key role in the early development of the capitalist system. Africans and Blacks were brutally enslaved to grease the wheels of early capitalism. Even after slavery was formally abolished, the Black population of the United States found itself living under the constant terror of an apartheid system. Slavery’s legacy remains. Deep racism still exists in US society. As the United States is weakened by Third World resistance and economic crisis, it is possible that national contradictions will once again become heightened. As Third World people gain their freedom, the White population may try to maintain its privilege by shifting the burden onto oppressed nations within US borders. As their First World lifestyle is eroded and as they face more racism and national oppression, oppressed nation peoples may strike out on their own. The result could be wars of national liberation, wars between national populations, and a Balkanization of the United States. Other kinds of Balkanization can occur. If capitalism enters a big enough crisis or there is a catastrophe of some kind, the federal government may not be able to maintain its power. Warlordism could arise in the United States in a big enough crisis or catastrophe. Remnants of the federal government, governors, mayors, military officers, police agencies, criminal organizations, religious organizations, and the Leading Light could battle for power under extreme crisis conditions. Balkanization will weaken the system, help destroy the First World, and allow greater opportunities for the Leading Light to maneuver. 5. Catastrophe. 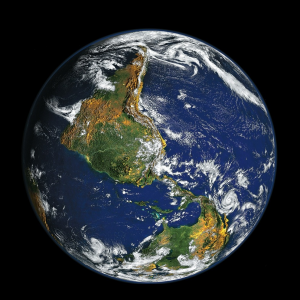 Ecological and other mass catastrophes could play a key role in bringing about the conditions for revolution in the First World. Capitalism is based on infinite growth. However, there is a finite amount of resources. As those resources are depleted, there will be more and more ecological crisis. Ecological crisis and catastrophes weaken and impoverish the First World, thus speeding up the revolutionary process, speeding up re-proletarization, speeding up Balkanization, etc. As the ecological crisis deepens, greater numbers of both Third and First World peoples will mobilize against the system in their own interests and interests of their children. 6. War, nuclear and mass destruction. Similarly, nuclear or other forms of war could also weaken the state and other institutions and create conditions for revolution in the First World. In general, wars weaken economies. However, the use of nuclear weapons by state or non-state actors against the United States has the potential to quickly weaken imperial power. Nuclear conflict is one possibility that revolutionaries need to prepare for. Our world is much different than Lenin’s. It is much different than Mao’s. Dogma is not going to create the next great wave of revolution. Cheerleading will not. Only the most advanced revolutionary science in the hands of the people can create a new future. 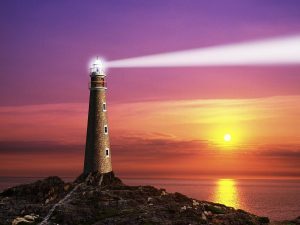 Leading Lights can handle the reality of today’s world. There is nothing more radical then reality itself. The Leading Light is for the most advanced. Leading Lights don’t sit on the sidelines. Surrender is First Worldism. Surrender is not an option for Leading Lights. Communism is not a spectator sport. Science, organization, leadership are key to victory. Lead. ← What is socialism? What is communism?